Interview with Kenny Wollesen and Julia Elsas | The Bottom Line "The Drawing Center"
Amber Moyles: Kenny has collaborated with many musicians over the years—in addition to Zorn, there is David Byrne, Tom Waits, and Sean Lennon—can you talk about the experience of your collaboration? Kenny Wollesen: As long as I am playing music with someone else, there is a collaboration happening. The energy that happens with other musicians ultimately comes to a point where everything is in sync whether it’s an hour on stage or a few days in the recording studio. But with Julia, since we’ve known about this project for a few months, it’s something that we have intensely worked on together. This project feels more focused and personal. Julia Elsas: We have talked on and off for a few years about doing some multimedia projects together (using sound and image), but the opportunity to have this performance at The Drawing Center really put the wheels in motion. Initially we began with one idea that morphed and grew into something entirely different. To both of us that is the beauty of collaboration. We came to this project with very different but complementary skills, creativity, and passions and created something that, alone, we probably wouldn’t have come up with. 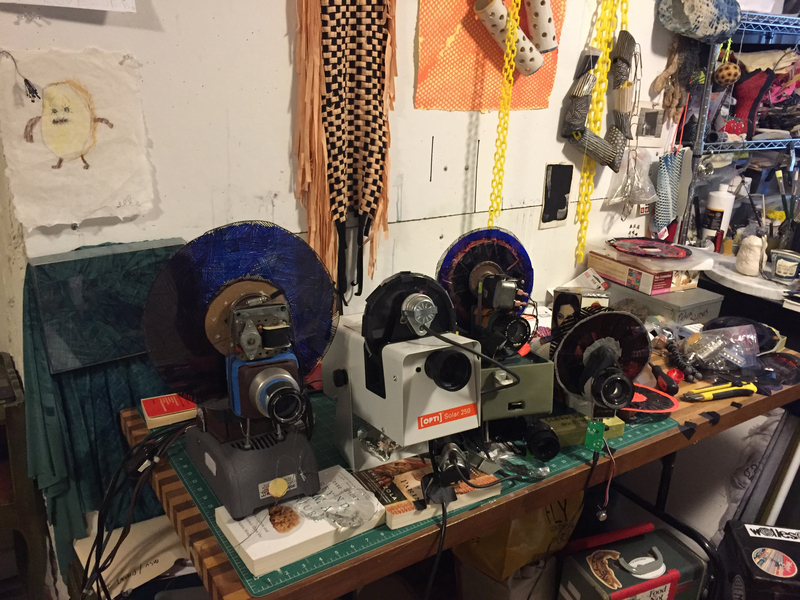 Both the visual elements and original instruments, which your audience at The Drawing Center can expect to see firsthand on Saturday, are inherently complex, crafted through numerous rounds of experimentation with many different material processes. Can you take us through the steps taken to create one or two of the instruments you’ll be playing? KW: Us, and two of our friends, Akemi Martin, and Brian DePasquale will be playing the five main instruments on Saturday. Akemi, Julia, and I are going to play ceramic udu drums that Julia made. Brian will play a wind wand, and I will also play a Bambingo. 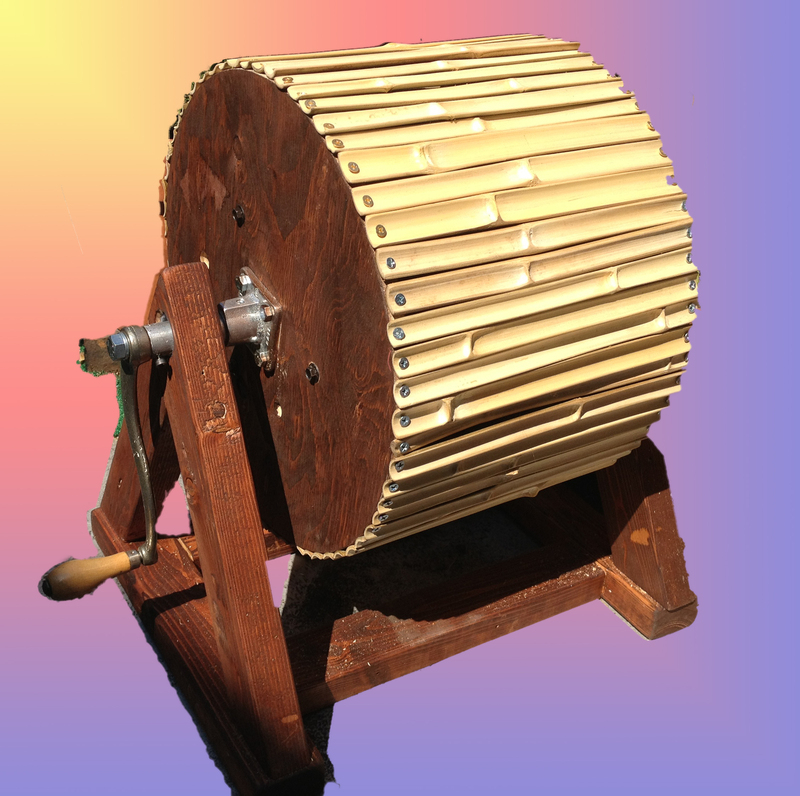 The Bambingo is a hand-cranked instrument made out of bamboo. It is designed with the idea that it is a sound loop, because the instrument is literally a circle. It has a finite pattern. A random element is introduced to the loop so the repeating groove is interrupted. JE: A few years ago when Kenny learned that I started working with ceramics, he commissioned an udu drum from me. 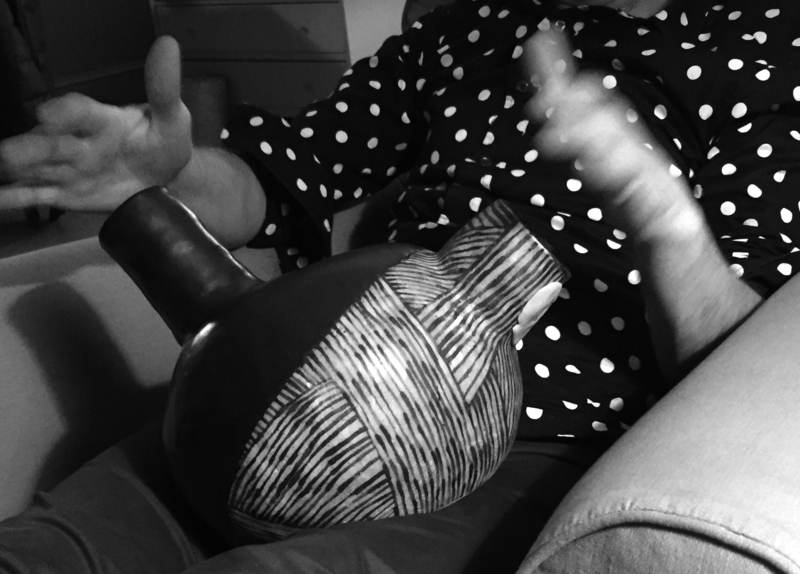 Traditional Udu drums are Nigerian musical instruments built by the women of the Igbo people. Originally udus were strictly used for women’s ceremonial purposes. The ceramic drums I have made are inspired by udus but don’t physically resemble the traditional instruments. They are all hand built and made to be amplified. Wollesen playing a ceramic drums made by Elsas. She was inspired by Udu drums, but hers don’t physically resemble the traditional instruments. One of Kenny’s latest projects, the Himalayas (a participatory marching band), is spontaneous, situational, and elicits varied responses from onlookers. What is the role of an audience member in your work typically? And, how do you foresee the experience of visitors to your performance on Saturday? KW: Because of my profession, an audience is almost always present in my work. The largest role of an audience member is to be the key that completes the circle of collaboration. Of course audience participation happens in a lot of ways, but in my experience you need one (the performer) to feed the other (the audience). The marching band is a very specific example because I am actively asking and encouraging wide audience participation regardless of experience, talent, or skill. In terms of our performance for The Drawing Center this weekend, we aren’t actively asking audience members to participate, but because we are filling the space with sound and image, the audience, just by being in the space, becomes a part of the work. A performance is a shared experience that is very unique and particular to a specific moment in time. We (the performers, the artists, the audience) are all complicit in making a performance happen. Our goal for Saturday is to create a unique, one-of-a-kind experience for all of us. Plus, everyone will get a snappy door prize at the end of the night! In one of the most intriguing conversations leading up to the performance, Julia mentioned that you are not sure how the visual elements of the performance were created. In other words, the process of creating them may not be repeatable. I am wondering if you can talk a little bit about the idea of recording and not recording in performance and music, and is there an inherent value in allowing performances and processes to be intentionally undocumented? JE: All of our videos were made by using a series of four or five Rotorific projectors. The Rotorifics were built by Kenny from old flea market slide projectors and motors. I made a series of drawings on transparent discs that we attached to the machines and projected on the wall in my studio. The visuals you will see on Saturday were created by projecting and layering a range of line drawings, old film strips, found photographs, gels, crystals, handmade paper, and cyanotypes. The creation of each video was a performance in itself. Everything we are doing at The Drawing Center on Saturday is a one-time performance that will never be done again. Besides taking some still photographs of the performance we are not documenting it in video form or recording the sound. We both feel that something like this can’t be documented and any digital or sonic reproduction of it will fall flat. The only way to experience it is to physically be there. See you Saturday night! Wollesen and Elsas prepping for their Basement Performance this Saturday.